Hey Rich what do you do with the Rails.? Ours are a protected species. A couple of species I have seen in Victoria. Hi Mate, I didn't want to post someone else's content on the open forum so can I send them direct to you. I reckon I have seen a pic of this stag before, Have you got any images of that stag? No I havent any at all and no connection to that stag either,a mate sent the pic to me originally. OK I will bite,what have you got? This forum is different and most hunt from what I can glean and some good boys among them too. Thats ambitious,perhaps hunting hay bales (practice and more practice) is the place to start. 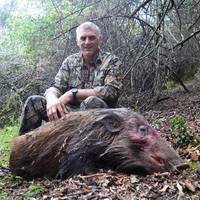 Theres more species in and around the Otways,including hoggies. They will be monitoring your FB page next lol! Tarzan? Not even close,i`m a skinny runt of a thing and I`m balltearer because i kicked a football that split one day in a match. btw Through is through and not trough ,thats where the laundry is dumped...snicker snicker! Be well, have a great new year, and i'm pleased you rested your case. Great and pleased you are the winner. Shoot well, and try not to buy a Beretta. balltearer here , because i did tear one as a kid and i`m keen to learn from the experienced on here.